The past season’s peak, which saw the Kolo National Folk Song and Dance Ensemble launch its seventieth anniversary celebrations, was officially marked with a performance that took place on 14 May in the crowded Madlenianum hall. 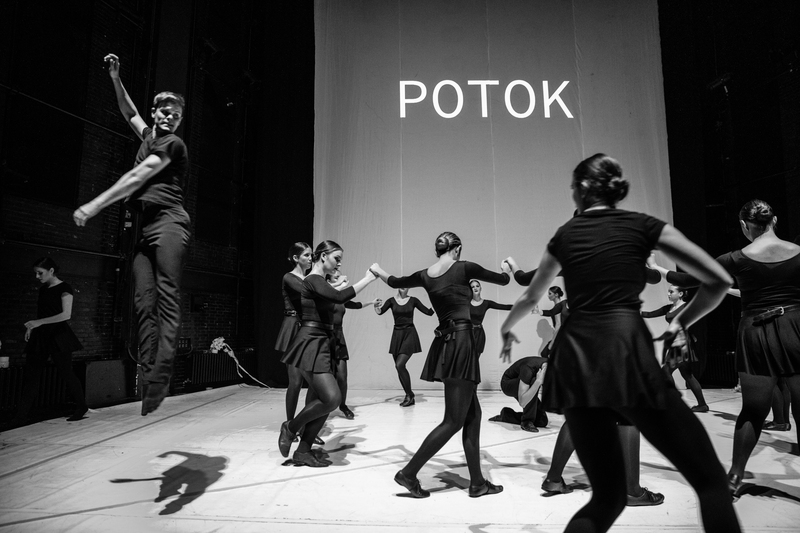 In addition to wrapping up the season, our national ensemble’s Belgrade performance was actually a tribute to celebrate its seventieth birthday, since the company was officially launched on 15 May 1948. In light of the well-thought-out, long-term concept titled TradicijaNova, which the management helmed by Managing Director Vladimir Dekić used to designate its overall repertoire and performance policy, this year’s birthday performance can be interpreted as a symbolic culmination of this ambitious project. In line with the immanent duality of its conceptual nexus, which relies on the synergy of the “old” and the “new”, that is, “the old in a new way” — as Vladimir Dekić pointed out in the early 2016 interview for the Vreme weekly — the ensemble’s current work, as exemplified by the birthday performance, sends forth ambivalence at different levels: in the repertoire policy, the stage and visual identity, the production, and the interpretation. Enveloped by traditional dance choreography from central Serbia, the evening’s repertoire range included choreographic works inspired by traditional dance heritage of various geographical and ethnic origins, following a logic of creating a slightly wavy, contrast-based dramatic curve of the evening without a true climax. “Dances from the Belgrade area” (“Igre iz okoline Beograda”) by Goran Mitrović and Dimitrije Obradović and “Filament of Serbian dances” (“Splet igara iz Srbije”) by Olga Skovran and Ljubomir Bošnjaković bookended the following choreographies: “Nevestinsko. Macedonian women’s dance motifs” (“Nevestinsko. Motivi ženskih igara iz Makedonije”) by Desanka Đorđević and Petar Josimović, “Old Bosnian silent kolo from Glamoč” (“Starobosansko nemo kolo iz Glamoča”) by Olga Skovran, “Gypsy dance from Vojvodina” (“Ciganska igra iz Vojvodine”) by Dobrivoje Putnik and Stanojlo Rajičić, “Šokci dances from Bač and Plavna” (“Šokačke igre iz Bača i Plavne”) by Dragomir Vuković and Borislav Janković, “Romanian dances from Banat” (“Rumunske igre iz Banata”) by Miroslav Marčetić and Milenko Skender, “Vlach dances” (“Vlaške igre”) by Dragomir Vuković and Petar Josimović, and others. Using this birthday performance collage programme, the ensemble’s artists consistently perpetuated the current ambivalent cultural policy of our country, balancing between the national focus of respecting the traditional values of Serbian cultural heritage and encouraging the pro-European idea of multiculturalism. With respect to the reasoning of this repertoire concept, perhaps it would be possible to use future repertoire content to critically reflect on the current cultural policy and sharpen the focus in terms of thematically oriented projects that will raise questions, as well as demonstrate attitudes or provide answers. Since birthdays are celebrated every year, those marking anniversaries could be different, their content accentuating their significance. Let’s not forget that Kolo — above all — is a national ensemble. Collage programme, however well-thought-out it might be, remains inevitably selective, and in this case also compromising. Despite the generally common repertoire structure, the selection of certain choreographic pieces that are rarely performed was truly exhilarating. These include the already mentioned “Nevestinsko”, “Komitas dance” („Komitska igra“), and “Romanian dances from Banat” („Rumunske igre iz Banata“), as well as “What’s that shining in Jova’s castle? (“Šta se sjaji u Jovinom dvoru”), “A filament of Srem dances” (“Splet igara iz Srema”) by Milorad Lonić and Ivan Sabo. Their performance reveals another duality: It is most certainly commendable that they — as world-class choreographic works — were again presented to the audience, but since they’re not part of the ensemble’s standard repertoire, their kinetic and rhythmic and spatial complexities were interpreted with a lack of comfort and ease and visible intent and restraint, and not always maximally exhausted energetic potential of movements and stage action. This remark does not pertain to performances that are often presented — and in this instance it especially excludes the performance of “Gypsy dances from Vojvodina”, where soloists Iva Stanković and, in particular, Miloš Vulović demonstrated extraordinary motivation. As for the May performance repertoire, we should also make note of the excellent performances of two vocal pieces: men’s songs from northwestern Bosnia “Let us sing, my brethren” (“Ajmo, moja braćo, zapjevati”) and women’s songs from the Kragujevac area “Why is the Morava muddied?” (“Što Morava mutna teče”) — both recorded and masterfully prepared by ethnomusicologist Sanja Ranković. Despite the ensemble’s disparity between dance and performance, we should acknowledge its remarkable progress in vocal interpretation — especially within the choreography — which must be credited, alongside Sanja Ranković, to voice coach Mirko Milovanović’s longstanding efforts, and for this evening in particular also the excellent sound production. While the dance performance potentials can be said to remain untapped in the ensemble’s present practice, thanks to its creative team, the stage and visual expression of concert activity is peaking in the true sense of the word. This duality actually represents the pronounced imbalance between the interpretation and the production in Kolo’s present efforts. 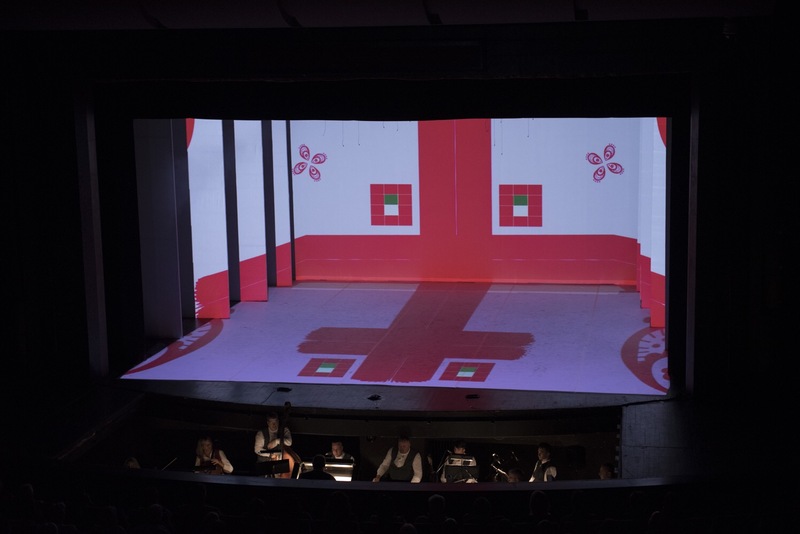 The May performance’s world-class stage and visual solutions are thanks to director Nikola Ljuca and multimedia designer Miloš Kozlovački, inevitably supported by the company’s managing director. These exceptional artists have managed to create a top-class production of the performed pieces. With the stage decor completely reduced and relying on the whitish and grayish surfaces of the floor and the backmost curtain, the technically exemplary video announcements of each piece are also extremely effective and carefully designed. These stage and visual solutions, too, contributed to the visionary execution of the dual idea that serves as basis for the TradicijaNova concept. Once again, this is “the old in a new way” — a futuristic reinterpretation of choreographies with traditional dances from past times in their core. Beautiful folk attires, myriad spatial compositions, and every single dance movement of the individual dancers and the ensemble became more prominent and adopted new meanings against the white backdrop. However, these stage solutions were not in favor of the choreographic intentions of individual pieces, and — although astonishing — the stage design functioned as an entirely standalone artistic expression. The video pieces, on the other hand, also contained duality — the reduced geometric forms in intense colours were switching places with simple bilingual announcements of each piece in the style of typical intertitles from silent films. Although the part of the audience not accustomed to alternative presentations of traditional dance saw these stage and visual solutions as unexpected — and thus too avant-garde — the undisputed creative and artistic value of these ideas must be especially noted. The ambivalences on which the Kolo Ensemble’s May performance is based — and which represent the paradigm of its present repertoire and performance policy — should not be a priori considered as disadvantage, but rather as a potential quality that is indeed the essential foundation of the TradicijaNova concept promoted by the ensemble’s current management. In anticipation of the further development of this comprehensive conceptual platform, and within it also the ensemble’s performance potentials rising, we congratulate Kolo its 70th birthday from the bottoms of our hearts.